Krystal Host Review 2019: Is Krystal Host a Good Hosting? A Mexican website hosting provider with beginner-friendly packages, Krystal Host offers 24/7 support, unlimited resource quotas, an uptime guarantee supported by third-party tests, and the relatively unusual SHOUTcast hosting. Founded in 2008, Krystal Host is a Mexican website hosting company with servers located in an American data center. Their website is in Spanish, which easily translates into English in the web browser. Krystal Host offers many different types of website hosting including the usual shared hosting, virtual private servers, and dedicated server rental. They also offer website design and the not-so-usual SHOUTcast hosting for broadcasting. 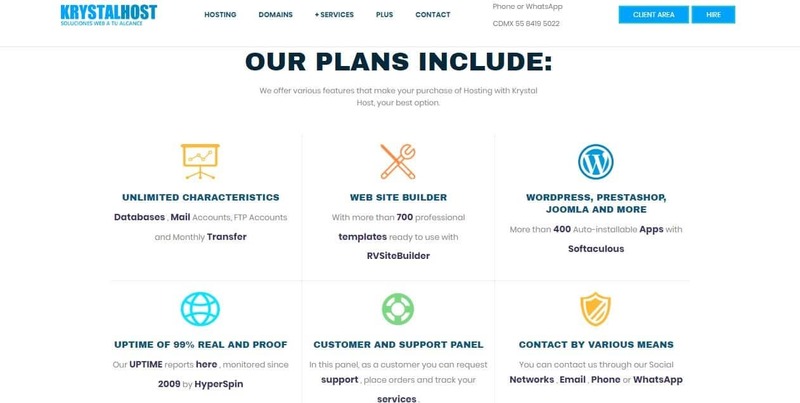 Beginners are very well catered for by Krystal Host because they offer a website builder with 700 readymade templates and a one-click installer for over 400 scripts. Given this excellent provision for beginners, I’m a little surprised that they don’t also provide for experts with support for PHP or advanced coding languages such as Python or Ruby on Rails. Krystal Host offers unlimited monthly data transfer, unlimited databases, unlimited mail accounts, and unlimited subdomains with all of their website hosting packages. Whilst we should always be cautious of the word ‘unlimited’, these are certainly very comprehensive packages, and the premium offerings are well above what other website hosting companies provide as standard. Krystal Host’s prices are very affordable when compared to both local and international competitors, especially when you considered all the premium beginner-friendly tools and unlimited resources. But beware that the following optional add-ons could increase the cost at the checkout: weekly backups, additional domains, SSL certificates, and domain registration. You can purchase hosting in three, six and twelve-month terms, with the price being reduced for committing to a longer term. There is no monthly contract, no money-back guarantee, and no free trial, but at least you only have to commit to three months as a minimum. Customer service can be accessed via email, telephone or the 24-hour ticket support system. They also offer live chat, but it wasn’t available when I visited their website, so it’s lucky I received a relatively rapid response to my email. Their FAQ page appears to be completely unpopulated, but (as far as I know) this might not be the case for logged-in users. Krystal Host offers an excellent array of website hosting plans. Their beginner-friendly shared hosting plans include 24/7 support, a premium website builder, and a one-click installer. Wondering how Krystal Host stacks up against other Web Hosting companies? Enter any other Web Hosting company and we will give you a side-by-side comparison.